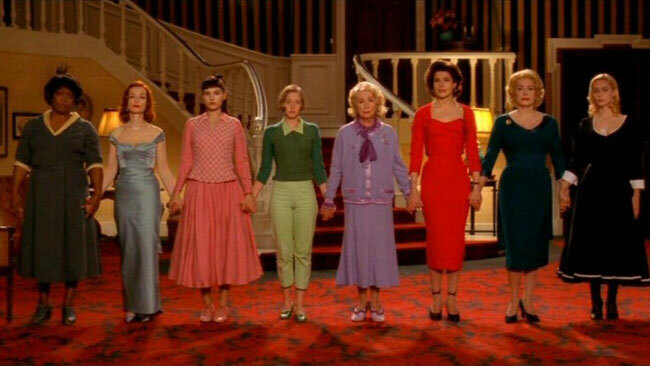 8 Women is one of the most beautifully stylized films of the last 20 years. Director François Ozon brought together the eight greatest—and most beautiful—working actresses in France. But this is much more a breathtaking pean to feminine beauty. It is also an ode to the Agatha Christie thriller and a homage to the 1950s Technicolor masterpieces of Alfred Hitchcock and Douglas Sirk and the kitsch musicals of Vincente Minnelli. The lush score by Krishna Levy quotes passages from ’50s soundtracks by Hollywood composers Bernard Herrmann and Miklós Rózsa, most notably the swelling arpeggios Herrmann created for Hitchcock’s Vertigo (1958). The single set, a living room and kitchen in a country house, is as much related to Hitchcock’s single-location films Dial “M” For Murder” and Rear Window as it is to the stage play the film is adapted from. The snow-white backgrounds glimpsed through the windows are obviously matte paintings, but everything in this film is unabashedly fake by design. Ozon called 8 Women “an anti-naturalist film which focuses on stylization and the artificial to heighten feminine beauty and glamour. All the actresses had to be of the kind of beauty that makes the audience dream so that the cruelty and horror become even more colorful, meaningful and strange.” The gorgeous costumes created by frequent Ozon collaborator Pascaline Chavanne certainly work heighten the feminine beauty and glamour, and also efficiently establishes the personality of each of the characters. Much more than that, Chavanne’s costumes represent the stages of the evolution of women’s fashion in post-war France. Before looking at the costume design in detail, a brief (spoiler-free) summary of the story and characters is order. As the costumes work so well to support the characterizations, an understanding of the characters will make the function of the costumes clearer. François Ozon had been mulling over the idea of creating a film with an all-female cast when he saw The Women, a 1938 satire directed by George Cukor featuring over 130 speaking parts, all female. When he inquired about the rights, he was informed that they had already been bought by Julia Roberts and Meg Ryan, which resulted in the universally-panned 2008 remake. Ozon then discovered the French play “Huit Femmes,” which originally premiered in Nice in 1958, had a successful run in Paris in 1961-62, and had a revival in 1971 that was filmed for French television. Ozon simplified the play a bit and added some more Agatha Christie-esque intrigues. The story, set in the late ’50s or early ’60s, opens with Suzon (Virginie Ledoyen), a college student arriving to her family’s snow-covered country estate. She has been driven home by her mother sophisticated Gaby (Catherine Deneuve). Suzon playfully greets her grandmother Mamy (Danielle Darrieux) who is napping in her wheelchair, and embraces the cheerful family cook Madame Chanel (Firmine Richard), but seems immediately suspicious of the new chambermaid Louise (Emmanuelle Béart). Suzon’s fastidious aunt Augustine (Isabelle Huppert) comes downstairs still in her robe, jumps to the conclusion that Suzon is home because she has been kicked out of school, verbally spars with her mother and sisters, and, furious that the dotting Chanel has made fresh brioche for Suzon while she only got toasts, stills the hot roles and returns to her room. Suzon’s younger sister Catherine (Ludivine Sagnier) sneaks up behind her, placing her hands over her eyes in a familiar game from their childhood. Catherine’s is reprimanded for her exuberance by her aunt Augustine, who is now dressed. Louise takes breakfast up to the family patriarch and Gaby’s husband, Marcel, and finds him dead in his bed, stabbed in the back. Shortly after, Marcel’s sister, Pierrette (Fanny Ardant), a nightclub singer and possibly a prostitute, arrives. She has never been in the house as she does not get along with her sister-in-law, and she is immediately viewed with suspicion by everyone. It becomes clear that one of the women in the house is the culprit. In addition to being a murder mystery, 8 Women is also musical, as each of the women takes their turn singing jazz standards and pop songs in late ’50s arrangements, further revealing their character. Pascaline Chavanne worked closely with Ozon while selecting a fashion era that would suite the feminine themes of the film, and decided on the 1950s, when, with the desperate years of World War II a part of the past, a return to opulence and the ultra-feminine in fashion were celebrated. Having agreed on a general era, the director gave Chavanne free reign to draw on sources of inspiration. The Edith Head-designed dresses worn by Grace Kelly in Hitchcock’s Rear Window and To Catch A Theif were one influence, and Christian Dior’s “New Look” collection from 1947. 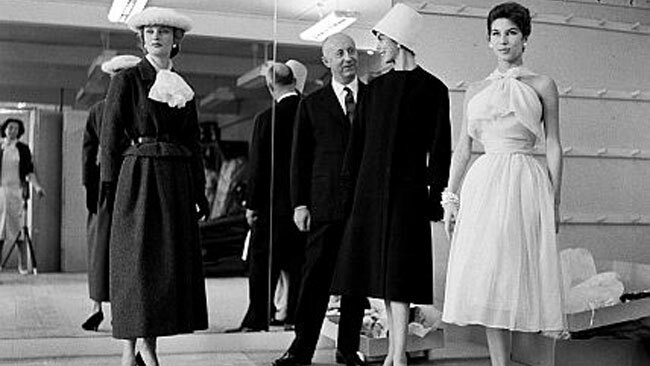 Dior recognized that women were tired of the boxy, uniform-like dresses of the World War II era. “I wanted my dresses to be constructed,” the iconic designer recalled, “molded upon the curves of the feminine body, whose sweep they would stylize.” Taking advantage of the fact that the wartime rations on fabric had been lifted, Dior fashioned dresses with yards and yards of fabric, creating a feminine form with clinched waist and full hips. Between World War I and World War II, the emphasis had quickly moved away from the bust and waist. The flapper style saw bag-like dress with a waistline that drop lower and lower, and it was soon below the hips, at which point it ceased to be a waistline at all. Suddenly, Dior announced that the bust and the waist had returned. He dubbed his first collection since the end of the war “Corolle,” a botanical term for the tender petals at the center of a flower. When Carmel Snow, the influential editor of Harper’s Bazaar, first saw the collection, she gasped “it is such a new look,” giving it the name that has stuck to this day. Suzon arrives home for Christmas vacation carrying a matching set of red plaid luggage, wearing a red wool A-line coat and a matching pillbox hat. Suzon is well loved by her mother and the cook Madame Chanel, and her arrival breathes a fresh breathe of life into the stuffy house. Her pillbox hat and pink and red color scheme recalls the Chanel-designed outfits favored by Jackie Kennedy, who similarly brought a sense of freshness and vitality into the American public eye at the dawn of the 1960s. 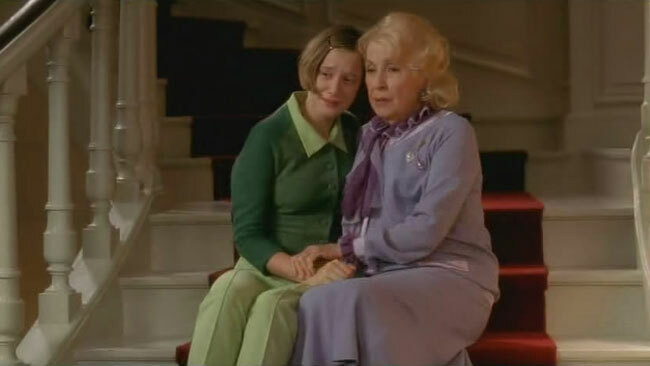 Suzon greets her (apparently) wheelchair-bound grandmother Mamy (Danielle Darrieux), who is wearing a lavender organza skirt with a matching jacket, a ruffled purple scarf, and an art deco broach and earrings. Burn in 1917, and currently still working, Danielle Darrieux has the longest career of any actress in the world, and she made scores of films in the 1930s and ’40s. As the oldest character in the film, who becomes a pillar of strength for the family, she is naturally dressed more conservatively than the others. But the choice of materials and the understated use of accessories echo back to an earlier era, namely the sophistication and elegance of the late ’30s and early ’40s. Suzon is then greeted by the cook Madame Chanel (Firmine Richard), who dotes on on the girl. Next she is introduced to the new maid, Louise (Emmanuelle Béart), who she immediately views with suspicion. Both of these characters are dressed in servant uniforms typical of the period, though later in the film they will shed the symbols of their servitude in order to assert their own identities. Chanel, who the other women are shocked to learn is a lesbian, leaves her employers, who are all dress as they please, to stand at the window of her kitchen and sing “Pour ne pas vivre seul” (To not be alone). Costume designer Pascaline Chavanne recalled that after Emmanuelle Béart was on the set and dressed in her maid outfit the actress requested taller boots to wear. After Béart’s character reveals that the had been the mistress of the murdered man, she stands in front of a gaudy painting of a younger version of Denevue’s character sings her song “Pile ou face” (heads or tails). In the process, she loosens her maid’s apron and undoes a few buttons. After the song she sits down and puts her feet up, revealing her very high leather boots, symbolic of her sexuality, which had been hidden to the other women. Next Suzon is playfully greeted by her younger sister Catherine (Ludivine Sagnier), who is still wearing a rather boyish set of pajamas. Later, Catherine changes into a pair of lime green capri pants with a matching top covered with a dark green wool sweater. Capri pants in the 1950s were very much associated with youth and freedom. Invented in 1948 by German designer Sonja de Lennart, capris caught the attention of legendary Hollywood costume designer Edith Head, who had the Italian tailors the Fontana Sister create a pair for Audrey Hepburn to wear as the runaway princess in Roman Holiday (1953). Hepburn would be dressed by two designers for her next film Sabrina (1954)—Edith Head created all of the clothes wore before her transformational trip to Paris, and all of the couture worn after her return was created by Hubert de Givenchy. It was the first collaboration of a long association between Givenchy and the iconic actress who soon became his muse. In Sabrina, Givenchy dressed Hepburn in the style of the young women who were stirring things up in the intellectual cafés of Paris—black roll-neck tops, tight Capri pants and flat sandals. The fresh look quickly caught one, and was worn by everyone from Doris Day to Jackie Kennedy, but no one ever looked better in the style than Hepburn. In 8 Women, Ludivine Sagnier’s character represents youth and innocence, and what could better suit her than the look the revolutionized ’50s fashion? The last of the eight women to arrive at the house is Pierrette (Fanny Ardant), the sister of the murdered man. She has never been allowed in the house before as she does not get along with her sister-in-law Gaby. Pierrette removes her silk scarf to reveal perfectly coiffed hair. As she sings “A quoi sert de vivre libre?” (What’s the use of living free? ), while performing what can only be described as a fully-clothed strip tease. She peels off her long black velvet gloves and tosses aside her long black coat, revealing a painted-on-tight lipstick red dress. She bubbles over with sultry sensuality, a fact proved later in the film when she is able to seduce her sister-in-law as the roll around on the carpet after a cat fight. The murder mystery element of the film continues of course, but this is really secondary to the overblown emotions felt by the characters on the screen, which is signified by the the saturated colors of the cinematography, the kitschy sets, the songs each character sings, and most of all by the thoughtfully designed costumes.